Heart disease is the leading cause of deaths, not only in the United States, but also globally. 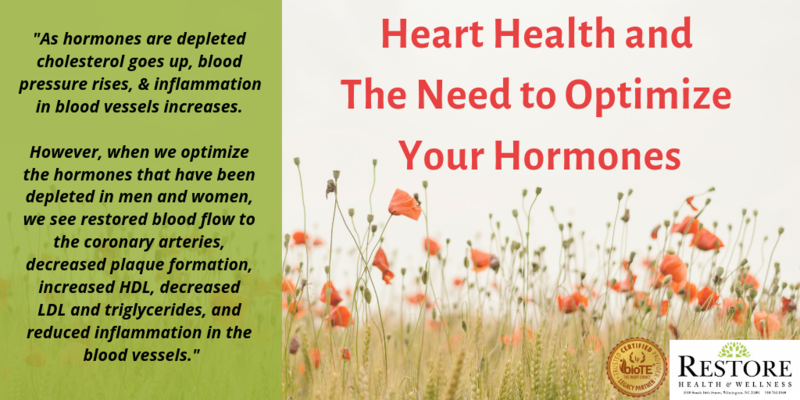 Once thought to be a “man’s disease,” women are just as affected and have the same number of deaths as men each year from heart disease in the United States. While staying at a healthy weight, eating a healthy diet, getting regular exercise, managing your stress and blood sugar, as well as controlling your blood pressure, cholesterol and triglyceride levels are all key to reducing your chances of getting heart disease, we may be missing an important part of the puzzle – the effect our hormones have on heart health and helping to accomplish the above list of positive health goals. Restoring our health and experiencing optimal wellness begins with learning WHY as well as HOW. Tabetha has shared a lot of wisdom with her patients over the years, and we wanted a format for you to glean from some of it. In this blog, we share articles from Tabetha and her staff to help you on your road to wellness. Content copyright 2015. Restore Health & Wellness, PLLC. All rights reserved. *Disclaimer: We make no claim of providing superior services, nor do we guarantee any specific outcomes from the services we provide. These statements have not been evaluated by the Food & Drug Administration. The information, opinions & products on this site are not intended to diagnose, treat, cure, or prevent any disease.